Hire a skilled instructors for private lessons or to take a group in for a supervised session. We have skateboard, scooter and in-line instructors who can be on hand at a time that works for you. 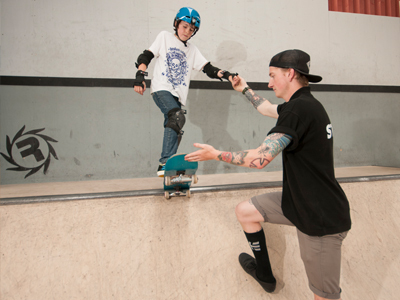 To hire an instructor is £25 per hour, in addition to the skatepark entry price of £7 plus equipment hire if required. When booking an instructor for your group or party we also provide certificates and a sticker each. An Instructor can’t be booked online please phone us on 01843 866707 to confirm your session. A deposit is required for all private lessons, payment can be taken over the phone on 01843 866707 or at the centre whichever is easier for you.